I've been a fan of Walden Robert Cassotto's for a long, long time, and I've been following the progress (or non-progress) of the bio-pic based on his life for an equally long time (couldn't have been any more pleased when I learned that Kevin Spacey was going to be the one to finally bring the project to the proverbial light of day). I'm mentioning this because I realize it's impossible for me to be completely objective about the movie, feeling about its subject as strongly as I do; I think that anyone who loved Bobby Darin cannot be thoroughly objective regarding Spacey's film. That having been said, I can tell you that I was profoundly affected by Beyond The Sea. Spacey lives up to his surname in spades with this project, by tossing out all the 'normal' bio-pic story-telling tools, instead resorting to a spaced-out show biz fantasy-type structure which does work because Bobby himself did use his career as an antidote against the reality of his ever-failing health and inevitable early death - his overwhelming drive and beyond-intense focus stemmed from the fact that he knew he had only so much time to do anything with his life; this is what made him so great on stage, and this immediacy and strength of purpose is conveyed brilliantly in the movie not through the usual talking and explaining sequences but rather through Darin's actions. So the liberties that Spacey takes with Bobby's life pay off - the song-and-dance numbers and the plot devices (the best one being Darin's younger self having a simultaneous part in the proceedings with the older Darin). So much has been written about Spacey being too old to play Bobby, how Spacey shouldn't have actually sung the songs himself, how this is a vanity project on Spacey's part, blah blah blah. All untrue. The clever way in which he stages the film acknowledges the fact that he knows he's chronologically older than the perfect age to play this part, and he sings the songs himself because he CAN - his voice is more than serviceable; in fact when I saw the trailer for the first time a few months back and heard him singing Mack The Knife I was in the theatre telling the person I'd come with "That's Bobby, that can't possibly be Kevin Spacey" - this from a person who has listened to Darin's recording of that song literally hundreds and hundreds of times. The thing that is most interesting about the negative criticism is the one about this being a vanity project for Spacey; his desire and enthusiasm to share his feeling for Darin via this project is being interpreted as an ego trip, when in reality it's an unabashed and pure labor of love. The film is being misunderstood by a lot of people, and I see this as being unbelievably ironic and, ultimately, proof that the film works because Darin himself was constantly misunderstood, constantly having his hell-bent-for-leather, no-time-to-waste desperation perceived as arrogance. So Spacey succeeded on that level alone. It also doesn't hurt that from the back, he manages to bear an uncanny resemblance to Bobby, he captures the physicality perfectly, and in all the shots that are not too close up, you'd swear it was Bobby that you were seeing and not Spacey. It's only in the close-ups that I was reminded it wasn't actually Bobby on the screen, and in the later scenes, when he becomes politically aware, grows the mustache and bills himself as Bob Darin, Spacey looks like him even in the close-ups. I want to include this: the person I saw the film with hadn't been a fan of Bobby's the way I had for years, and I asked her after we'd left the theatre if she'd felt moved by what she'd experienced - I was trying to get a more objective idea how the movie would play to someone who wasn't so emotionally connected to the material. She said that after seeing it, she wanted to know more about Bobby, how she'd had no idea what he'd gone through in his life and how she felt tremendous compassion and respect for him. Spacey has said that his motivation in doing the movie was to remind people who hardly remembered him what a monumental talent Bobby Darin was, and to hopefully introduce a new generation to the man. I think he's succeeded on that level too, at least with people who go to see this movie with an open mind and a receptive heart. 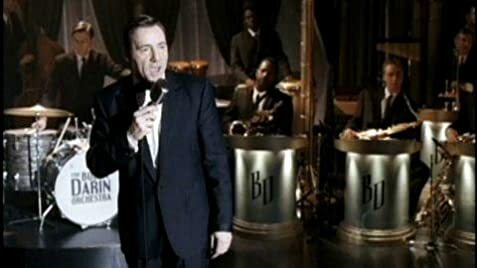 When financing looked as if it might fall through just before filming was to start, Kevin Spacey persuaded Lionsgate Vice Chairman Michael Burns to get that studio on board by driving Burns around in a car and playing a medley of Bobby Darin songs. At some point Burns made an observation about Darin's singing. Then Spacey told him, "That's not Bobby Darin, that's me." Sandra Dee: Charlie walked in on me in the shower earlier. Bobby Darin: Oh, really. What did he want? Sandra Dee: He asked me if I wanted a corned beef sandwich. (at around 1:10:00) When Bobby can't start his car after the fight with Sandra, the car has only one headlight on. When he takes a golf club right after that and starts smashing the car, both sets of headlights are on, including the brights. "Andy Paterson and Kevin Spacey would like to thank the entire cast and crew from both the UK and Germany for their hard work and dedication. The film could not have been completed without their belief and effort. We are forever grateful to them for helping bring this film to the screen." Courtesy of HEC Enterprises Ltd./EMI Records Ltd.
With A Star is Born going 'Drama' where does that leave the 'Musical/Comedy' race at the Golden Globes?